In Part 2, we elaborated on the concept of public domain vs. patenting and its implications. Here, we’ll try to anticipate what the cannabis industry would look like if based on an IP-centric approach to creativity and innovation. We’ll refer to existing examples in “conventional” agriculture and derive some possible scenarios. At the same time, we can’t resist asking: what would it look like to have breeders and growers collaborating with an open source approach? If patenting cannabis plants becomes common practice, potentially dozens if not hundreds of patents could be issued in the US, Canada and other countries to grant exclusive rights over certain strains, to certain people or groups of people (i.e. companies). When it comes to cannabis, biodiversity matters at least as much as for any other plant. Many distinct cannabis cultivars have been preserved and created over the past centuries, and this, despite the prohibition that has lasted for over a hundred years now. 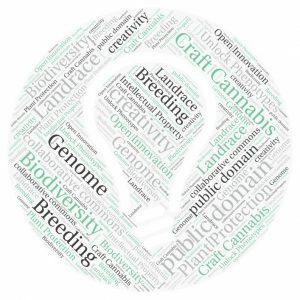 Without realizing, cannabis breeders have been pioneering today’s popular concepts of “open source” and “open innovation”, following an untold code of conduct… Legalization will surely impact how cannabis biodiversity is addressed. Cannabis has various material components creating distinct effects depending on concentrations and combinations. Among those, cannabinoids and terpenes are key. Scientists have already demonstrated that cannabinoids address various sorts of symptoms and conditions, such as chronic pain, arthritis, gastric-system illnesses, chronic stress, muscular tension… just to name a few. An increasingly popular cannabinoid, CBD, has also been used to treat seizures and certain forms of autism for some years now. The scientific and academic community has yet to fully grasp the benefits coming from cannabinoids but they seem truly promising. Cannabinoids offer the perspective of treating conditions currently addressed with opioids, but with much more bearable side effects, much less addiction and hopefully… at a lower cost for patients. Terpenes are perhaps a younger sibling when compared to cannabinoids. However, with the increasing number of laboratories analyzing cannabis samples, and academics getting involved in the study of cannabis, terpenes have been brought to the spotlight, especially after discoveries about the entourage effect. There are many more distinct terpenes than cannabinoids. The land of terpenes is vast to explore and it will likely take an entire decade for academics, breeders and growers to fully understand how terpenes affect cannabis consumers. Why so long? Because we already know that the combinations and concentrations of terpenes have widely distinct effects. Limonene on its own interacts with our body and psyche in a different way than limonene combined with alpha-pinene for instance. Given that 11 primary terpenes and another 20 secondary terpenes can be found in cannabis, combinations of terpenes and consequent effects are potentially very diverse and hopefully groundbreaking in the healthcare space. Back to the entourage effect. Terpenes interact with cannabinoids. They can influence how cannabinoids are absorbed by the endocannabinoid system, or degrade over time. The interaction between cannabinoids and terpenes, and the identification of the consequent effects has also to be fully mastered, but the point is, we have to create the conditions for as many cannabinoids and terpenes combinations to be available to the public (patients and consumers). It becomes pretty clear that the possibilities of treating patients and experiencing cannabis effects in a social context are beyond what can be imagined today. However, the variety of possibilities is directly dependent on the biodiversity of cannabis. The more cultivars, the more combinations and concentrations of cannabinoids and terpenes there will be. A reduction in cannabis biodiversity would directly limit these exciting possibilities. Whether it’s for improving patients quality of life, treating illnesses or simply having a relaxing and enjoyable experience in a social context, cannabis biodiversity is THAT spark of possibilities. Cannabis appears under many forms, colors and smells. They can be irregular and unstable but are at least numerous. If patenting inexorably leads to streamlining of genetics, diversity of forms, colors and smells will likely reduce. One benefit could reside in the improved stability of genetics and consistency of manifested phenotypes, but patenting is not a prerequisite to stabilizing strains. Experienced breeders are able to stabilize their strains, up to the point of being considered true breed line, without necessarily patenting them. These are two different and independent initiatives. That said, it’s pretty certain that, while improving consistency of phenotypes, patenting would also reduce diversity of phenotypes, leaving fewer options to consumers but standard and consistent products. With time, consumers may even reject cannabis that is not looking “perfect” enough or smelling “as expected”. This is what already happens with our food, where consumers leave any tomato or pepper that have cosmetic imperfections on the shelves, without even considering what vitamins or nutrients the fruit may contain (… or not!). Will weed follow the same standardization and “cosmetic-first” route? what are the possible routes? Now, what is the most effective way of preserving biodiversity? Why is it so important? Some will argue that granting exclusive rights over a certain cultivar to its creator, maximizes the reward period (i.e. the patent principle) and is therefore an incentive to create more cultivars. In short, patents fuel innovation. In practice, history has demonstrated on numerous occasions that patents can be used to limit innovation, or worse… prevent it. When a creator (e.g. a cannabis breeder) is granted exclusive rights over a strain, it actually creates a situation where such a breeder will want to maximize the return for as long as possible, before breeding new strains. Because of the incurred costs, patents drive their holders into an understandable mindset of “maximizing the Return on Investment”. In the “conventional crops” world, we observe a direct correlation between the issuance of Plant Patents / Plant Breeders Rights and the reduction in cultivars available on the market. In most cases, patent holders are corporations whose goal is to maximize the return on invested dollars by streamlining the genetic lines (fewer but more profitable cultivars to maintain and distribute). The logic of patenting implies a reduction in the number of cultivars, as it’s not only financially but also practically impossible to enforce exclusive rights over multiple cultivars without having very significant resources. Usually, organizations innovating in a patent-driven industry absorb or get absorbed, contributing to more concentration and more streamlining of genetics. This scenario probably implies the demise of cannabis breeders as we know them, which would only be accelerated if they start patenting their own strains! A decade from now, we might end up with a couple hundreds patented strains generating profits for a few large corporations (for which cannabis is one line of business), which will introduce fewer new phenotypes, potentially resulting in limited consumer experiences and patient treatments. Until the 1960s, no farmer was growing and commercializing patented plant varieties. Slowly, convinced by effective marketing from chemical corporations, farmers were seduced by the opportunity to outsource seed production and storage to the companies providing the fertilizers. 50 years later, farmers are completely dependent on those same corporations holding exclusive rights over the streamlined range of plants they grow. They have access to fewer varieties of tomatoes or peppers they used to have access to. The same varieties are grown across the globe, rarely adapted to the environment, which requires using more fertilizers and pesticides to compensate for this inappropriate cultivar/environment fit. They also have to buy seeds or pay royalties every year. It’s the breeding ecosystem as we know it, one that by its organic and underground nature has managed to remain resiliently prolific, that could be at stake today. The most commonly observed alternative is a concentrated patent-based model. Cannabis breeders considering patenting their strains are probably doing the paperwork for corporate takeover. Do we want to repeat the same model “conventional” farmers followed? Or should we invent a new model, OUR model. One that fosters creativity with an open innovation spirit, one that values the concept of public domain creations over patent-driven restricted innovation. We believe an open innovation approach to breeding is critical for the cannabis industry to reach its full potential. Patients and consumers are strain-aware which is why introducing new strains is a must for producers, processors and retailers to remain relevant in the market. Check out how this can be achieved! Awesome article guys! Whoever wrote it actually understands the economics of breedingz . Impressive!